The New Orleans Saints are good, and the Philadelphia Eagles have to play them this Sunday. It will not be an easy game. #Analysis. Here are five matchups to watch. Ronald Darby and Rodney McLeod are both out, Sidney Jones hasn't played in over a month and is "day-to-day," per Doug Pederson, and Jalen Mills didn't practice on Wednesday. There's a chance that the Eagles could still be missing four of their top five defensive backs against the most efficient passing attack in the NFL. That's bad. #Analysis. In my view, with apologies to Patrick Mahomes, Drew Brees is probably the favorite to win the MVP this season. He currently has a QB rating of 123.8, which would be a new single season NFL record if he can keep it that high the rest of the season. He has 21 TDs vs. 1 INT, and is completing 77.3 percent (lol) of his passes. "I looked at his interception reel," said Jim Schwartz. "That was one. Didn't take us long to get through the sack and interception reel. His incompletions, didn't take us long to get through those. I mean, he's playing at an insane level right now. It's sort of a trend of where the NFL is. When I was a kid, if a quarterback completed 50% of his passes, that was considered good. If he had as many touchdown passes as interceptions, it was considered playing pretty good quarterback. Then it started becoming, you need to throw twice as many touchdowns as interceptions. Then you need to complete 60% of your passes. "Now pretty much everybody is like near that 70%. He's close to 80. He's 77 point something. How about 21-1 touchdown interception? He's made those things the new standards. Extremely accurate quarterback, smart, knows where to go with the ball. Still has good mobility, can buy time. We certainly have our work cut out for him." I mean, not to oversimplify things, but on paper, this is a huge mismatch in the Saints' favor. Of course, the Eagles could give their secondary some much needed help if they can get their pass rush going. But even that feels unlikely. Ever since his blazing hot start to the season, opposing offenses have made sure that Fletcher Cox is not going to wreck the game, as he has seen an increasing number of double teams. Unfortunately for the Eagles, whatever tomato can they've put next to Cox at DT (Michael Bennett aside) has been unable to beat their man one-on-one. The Saints don't have a great interior offensive line, but that doesn't matter, seeing as they can give Cox extra attention and don't have to worry about the other DT beating anyone. As such, it is imperative that the Eagles get their pass rush going on the edges. Last Sunday against the Cowboys, Brandon Graham started to come alive, as he had 1.5 sacks, while Bennett had 2 sacks, bringing his season total to 5.5. Getting to Brees from the edges won't be easy, as the Saints have an excellent pair of offensive tackles in LT Terron Armstead and RT Ryan Ramczyk. 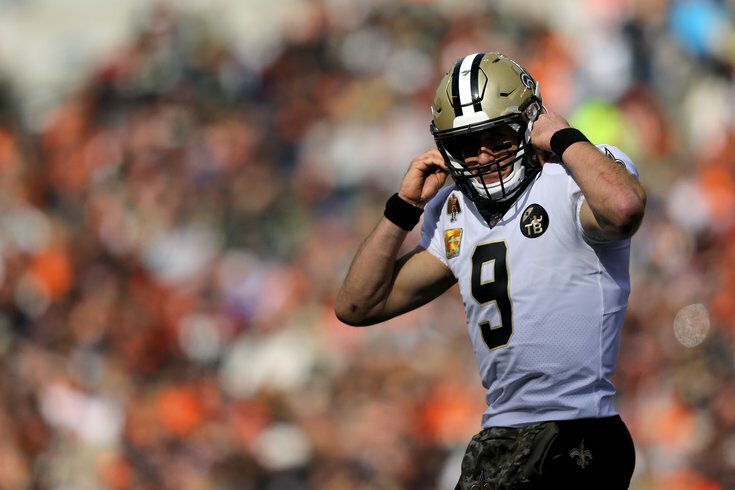 On the season, Brees has been sacked just 9 times, and has only been hit 28 times, both of which are best in the NFL. Update: Armstead will apparently be out on Sunday, so that helps. Oh, and hey, in addition to Brees' passing efficiency, the Saints run the ball well too. Alvin Kamara is averaging 4.4 yards per carry and has 11 rushing TDs, Mark Ingram is averaging 4.5, and when they bring in Taysom Hill (yet another pesky look opposing defenses have to prepare for), Hill is averaging 5.8. The Eagles have been a good run defense for most of the season (or have they? ), largely because most opposing offenses have decided that attacking them through the air is more fruitful. But the reality is that they have allowed 4.7 yards per rushing attempt, which is tied for 22nd in the league. Obviously, the Cowboys gashed the Birds on the ground last Sunday with Ezekiel Elliott. It won't get much easier this Sunday. Against the Cowboys last week, the Eagles faced a great pass rusher in Demarcus Lawrence, who primarily lines up opposite the right tackle. This Sunday, they'll face another great (and underrated) pass rusher in Cameron Jordan, who has 6 sacks this season, and had 13 sacks in 2017. "Cam Jordan is a tremendous pass rusher," Doug Pederson said on Wednesday. "One of the elite guys in this league. They'll line him up pretty much anywhere on the D-line." While they do move him around, as Pederson noted, Jordan will see the bulk of his snaps at LDE up against Johnson or Vaitai, depending on Johnson's availability. And once again, whether it's Vaitai or a less than 100 percent Johnson, the Eagles would be wise to give their right tackle additional help. Ideally, the Eagles would love to be able to control the ball on offense and keep Brees and Co. off the field. To do that, they could use some production from their rushing attack, which they simply haven't gotten this season. The Eagles may very well have the least appealing running back rotation in the NFL, and the Saints have the No. 1 rushing defense in the NFL. That is obviously skewed to some degree because they have played with a lead for most of the season, but it's yet another significant obstacle for the Eagles to overcome.